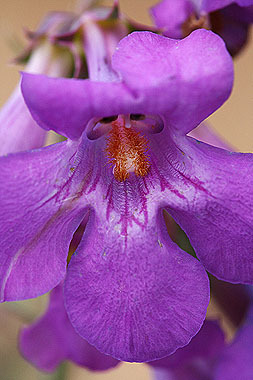 Flowers of Penstemon secundiflorus are crowded onto one side of the stem. Leaves are thick and smooth. Stamens do not stick out beyond the petals. Penstemons have a staminode, or non-functional stamen. The staminode of P. secundiflorus is densely covered with golden hairs. 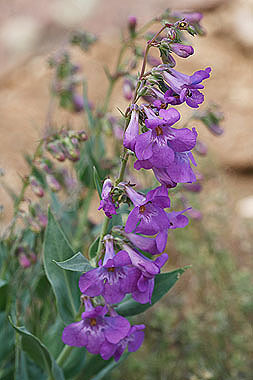 Compare to Penstemon unilateralis. Both species have flowers on one side of the stem. P. unilateralis, however, has no hairs on the staminode and has narrower, greener leaves.